It’s no secret that we are big fans of Ikea. We love the furniture, we love the Swedish meatballs and we especially love the affordability. But it can be somewhat disheartening to walk into someone's home to find it looks exactly like yours because they have also decked out their place in Billy bookcases, Malm bedroom furniture and a Metod kitchen. We’ve all seen the DIY Ikea furniture hacks splashed over Instagram and Pinterest, but have you thought about customising an Ikea kitchen to make it your own? It's very doable, inexpensive and a brilliant way to create a unique look on a low budget. We’ve put together our favourite ways to customise an Ikea kitchen so you can inject a bit of individuality into your home. Want more kitchen design advice? Go and check out our ultimate guide to planning, designing and furnishing a kitchen. So as it turns out, despite their very affordable price point, Ikea kitchen cabinets are good quality, especially if they are fitted properly; in fact, they have built themselves up a bit of a cult following who swear they are the best out there. Their drawers in particular have gotten a lot of love of late. They are made by Blum, who also supply to high-end kitchen companies. 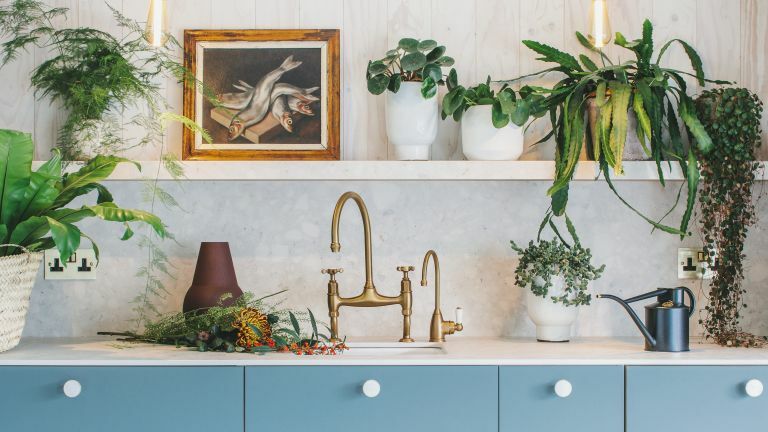 Tim Diacon and Adam Vergette founded Plykea, an upscaling service that transforms Ikea Metod Kitchens with the help of bespoke and stylish plywood fronts and worktops; and the results don't disappoint… (see below). This new Bristol based company are all about offering really affordable ways to add custom elements to your Ikea kitchen. They offer everything, from cabinet fronts in an array of gorgeous colours and oak worktops to sinks and handles (see below). One of the pioneers of the world of Ikea kitchen customising, Superfront can provide everything you need to give your kitchen a completely bespoke look. We mean really, does this look like an Ikea kitchen (below)?! A super budget friendly way to customise your Ikea kitchen is to shop for knobs and handles outside of Ikea. You could hunt around in antique shops for some reclaimed kitchen handles or have a look around more expensive kitchen manufacturers and buy their hardware instead. Want to give your current Ikea kitchen a bit of a facelift? Try painting your kitchen cabinets. Just be aware that a lot of Ikea furniture is laminate, and paint doesn’t adhere well to laminate. But we have learnt a great tip from Swoonworthy, and that’s to spray it with a thin layer of adhesion promoter, which essentially acts as a bond between the shiny smooth plastic and the primer. For more tips on how to paint kitchen cabinets, check out our step-by-step guide. Or if you have the budget, invest in a marble (or marble effect) worktop for a more luxurious vibe. Find more info about the best types of kitchen worktop in our guide. Similarly, a kitchen splashback is another area of your kitchen where you could spend a tad more money getting exactly what you want. It’s usually a pretty small square footage and installing a splashback is really easy, if you are going for tiles, you could even tile a splashback yourself. Go for some bold mosaic tiles, or a sheet of a really eye-catching material, investing in stuff like this is what is going to make your kitchen unique to you. For more kitchen splashback ideas check out our feature. Litt vår på kjøkkenet!!  〰️ Nyt en herlig ettermiddag!! 〰️______________________________________________________________#mycountryhome #küche #delvakkerthjem #lantkök #kitchen #kitcheninspo #eclectichome #passion4interior #inspirasjonsguidennorge #boligdrøm #rustichome #vakrehjemoginteriør #interior4all #kjøkken #kitcheninspiration #interiorwarrior #delmittøyeblikk #kk_living #myhyggehome #interior_and_living #charminghomes #myinterior #cornerofmyhome #asafotoninspo * #linflo66 Linda .